As soon as it becomes warm, we start to see weddings, that's why I think we should take a look at wedding guest dresses to wear this 2018 year. One thing is known for sure: wedding guests should be appropriately dressed for any wedding, in other words saying, there should be a dress code, which normally is written in every wedding invitation (no matter if it's an e-mail or mail). Normally there are several dress codes, but everything depends on newlyweds creativity. Anyway, it's essential to know the basics. 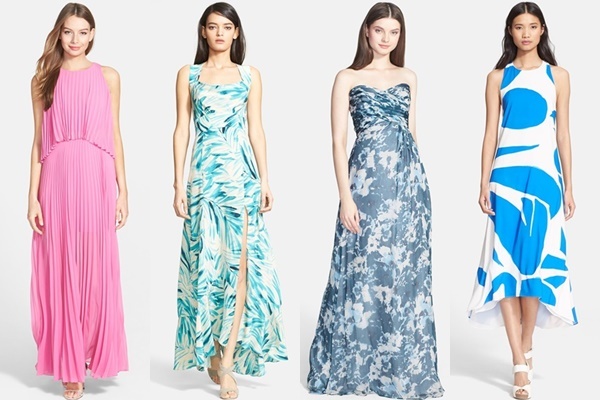 So, there are “black tie”, “black tie optional”, “dressy casual”, “festive”, “beach formal” and “casual.” Hope you will enjoy my writing and these adorable dresses for your inspiration. No matter what people say, but it looks like summer wedding season is upon us and it's the right time to look for wedding guest looks. In today's post I am going to show you my top 20 fancy guest looks that you can try on this summer season. You are going to see pretty cocktail numbers, ideal designs for open air events, ballroom appropriate looks. Of course it's a big stress if you are heading to several summer weddings which means re-wearing the same outfit is unfashionable. That's why you need various pieces to have different looks. That's a lovely summer look in white color and yellow floral print. Try it on with a skinny leather belt cinched at the waist. You can add black pumps and creative clutch.